THE BRILLUSTRATOR: Dat'sa Gooda Paper! 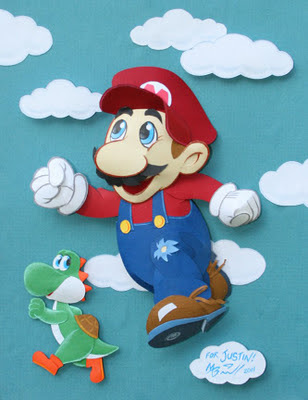 Today's paper sculpture is the piece I did for my nephew, Justin! He's a big fan of all things Mario Bros. I had to research this because the last time I played Mario was on the first version of Nintendo...and he was just a blocky little chunk of pixels! Since then he's come a long way--and there are many versions of him floating in the ether. I considered giving him the raccoon tail and ears, but it was pointed out to me that was from before Yoshi's time and Justin really likes Yoshi and so I wanted him to be in there too. My one addition was to give him the shoe laces (because they always look cool in paper sculpture, and the little torn area on the knee. Just gives him more personality...so he's not too clean. This piece was also built for an 8x10 frame, so it's all pretty tight. But it came out pretty well, and Justin didn't find fault with my interpretation of his hero!